Michael Winterbottom's largely improvised 2010 film, The Trip, took comedians Steve Coogan and Rob Brydon—or semifictionalized versions thereof—on a restaurant tour around northern England. In this witty and incisive follow-up, Winterbottom reunites the pair for a new culinary road trip, retracing the steps of the Romantic poets' grand tour of Italy and indulging in some sparkling banter and impersonation-offs. Rewhetting our palates from the earlier film, the characters enjoy mouthwatering meals in gorgeous settings from Liguria to Capri while riffing on subjects as varied as Batman's vocal register, the artistic merits of "Jagged Little Pill," and, of course, the virtue of sequels. Winterbottom trains his camera to capture the idyllic Italian landscape and the gastronomic treasures being prepared and consumed while keeping the film centered on the crackling chemistry between the two leads. 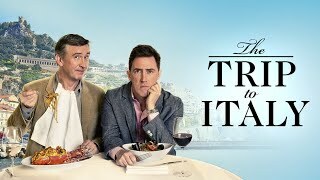 The Trip to Italy effortlessly melds the brilliant comic interplay between Coogan and Brydon into quieter moments of self-reflection, letting audiences into their insightful ruminations on the nuances of friendship and the juggling of family and career. The result is a biting portrait of modern-day masculinity.